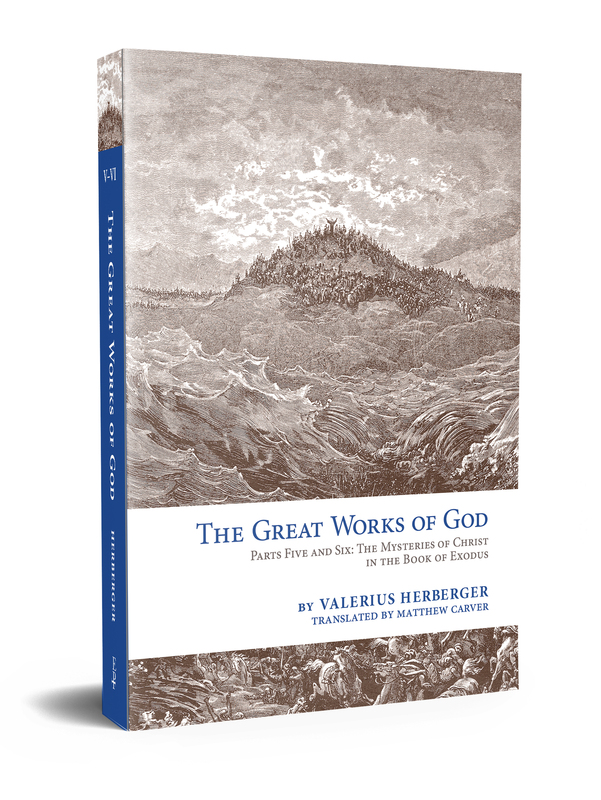 Originally written in German by Lutheran pastor Valerius Herberger, The Great Works of God: The Mysteries of Christ in the Book of Exodus is now available in English, thanks to the work and talent of translator Matthew Carver. This book is an outstanding resource for reading Exodus devotionally, focusing on Jesus as the center of Scripture and the fulfillment of all the types in Exodus. A book of this caliber would normally carry a hefty price tag. However, thanks to the generous patronage of the Master of Divinity class of 2018 of Concordia Theological Seminary, Fort Wayne, we are able to offer it at the affordable price of only $39.00. By sponsoring The Great Works of God: Exodus as their class gift, it is their wish, and ours, that this theological treasure be accessible to Christians throughout the world. *Leading up to the release date of May 8, 2018, we’ll be posting more details and excerpts. See the right sidebar to sign up for emails or Like us on Facebook to keep updated. This entry was posted in Latest News and tagged Exodus, Matthew Carver, Valerius Herberger. Bookmark the permalink.